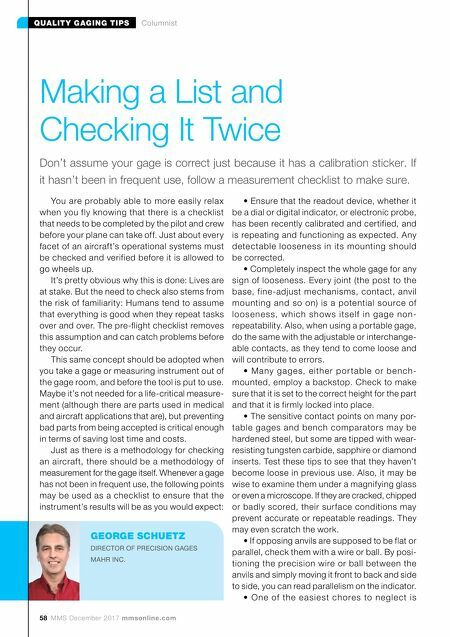 58 MMS December 2017 mmsonline.com QUALITY GAGING TIPS Columnist You are probably able to more easily rela x when you fly knowing that there is a checklist that needs to be completed by the pilot and crew before your plane can take off. Just about every facet of an aircraft's operational systems must be checked and verified before it is allowed to go wheels up. It's pretty obvious why this is done: Lives are at stake. But the need to check also stems from the risk of familiarity: Humans tend to assume that everything is good when they repeat tasks over and over. The pre-flight checklist removes this assumption and can catch problems before they occur. This same concept should be adopted when you take a gage or measuring instrument out of the gage room, and before the tool is put to use. 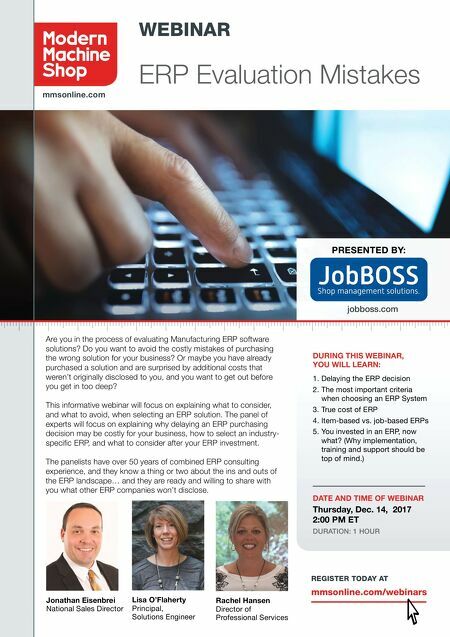 Maybe it's not needed for a life-critical measure- ment (although there are parts used in medical and aircraft applications that are), but preventing bad parts from being accepted is critical enough in terms of saving lost time and costs. Just as there is a methodology for checking an aircraf t, there should be a methodology of measurement for the gage itself. Whenever a gage has not been in frequent use, the following points may be used as a checklist to ensure that the instrument's results will be as you would expect: • Ensure that the readout device, whether it be a dial or digital indicator, or electronic probe, has been recently calibrated and certified, and is repeating and functioning as expected. Any detectable looseness in its mounting should be corrected. • Completely inspect the whole gage for any sign of looseness. Ever y joint (the post to the base, fine-adjust mechanisms, contact, anvil mounting and so on) is a potential source of lo ose n e s s, w hic h s hows i tse l f in g ag e no n- repeatability. Also, when using a portable gage, do the same with the adjustable or interchange- able contacts, as they tend to come loose and will contribute to errors. • M a ny g ag e s, e i th e r po r ta b l e o r b e nc h- mounted, employ a backstop. Check to make sure that it is set to the correct height for the part and that it is firmly locked into place. • The sensitive contact points on many por- table gages and bench comparators may be hardened steel, but some are tipped with wear- resisting tungsten carbide, sapphire or diamond inserts. Test these tips to see that they haven't become loose in previous use. Also, it may be wise to examine them under a magnifying glass or even a microscope. If they are cracked, chipped or badly scored, their sur face conditions may prevent accurate or repeatable readings. They may even scratch the work. • If opposing anvils are supposed to be flat or parallel, check them with a wire or ball. By posi- tioning the precision wire or ball between the anvils and simply moving it front to back and side to side, you can read parallelism on the indicator. • O ne of the e asie st chore s to ne gle ct is Making a List and Checking It Twice Don't assume your gage is correct just because it has a calibration sticker. If it hasn't been in frequent use, follow a measurement checklist to make sure. GEORGE SCHUETZ DIRECTOR OF PRECISION GAGES MAHR INC.